“Gobble, gobble.” That unique sound is unmistakably the sound of a turkey. Turkeys are most notably associated with the Thanksgiving holiday. 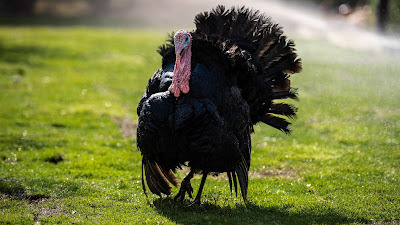 If you have ever had the pleasure to see live turkeys then you know they are interesting birds. Wild turkeys live all over the North American continent. They are native to this land. They usually live in wooded habitats and like to frequent fields and meadows. They spend most of their day looking for food which includes seeds, grass, insects and most anything they can eat. At night they roost up in the branches of trees safely above their predators. You may be surprised to learn that turkeys can fly. They can run 25 miles per hour (40.2 kph) and fly as fast as 55 miles per hour (88.5 kph)! In the spring time hens (female turkey’s) make nests on the ground often at the base of trees to raise their young. After poults (turkey chicks) hatch they grow quickly and are big enough to roost in trees at two to four weeks old. The poults join their mothers in her flock. Turkeys separate themselves into different groups called flocks based on gender and age. The mature gobblers (adult male turkey) are in their own flock, the young hens with chicks are in another, the older hens are in a third flock, and the young males are in a forth. Each flock is a close group that stick together and watch out for one another. These smaller flocks move independently through the forest but stay close to the others forming a large flock. Perhaps we can all learn a lesson from the turkey about giving thanks. It is not something to do only once a year at the Thanksgiving holiday. Nor is it something to do only when we receive a big blessing or have our prayers answered the way we want. We receive numerous blessing each day from our Father. We can be thankful for each of those blessings every day, even simple blessing like good weather. We always have a reason to give thanks to God. One good reason is that God’s love for us endures forever, just as it says in the key text. We should give thanks to God no matter what, even for the difficult things we go through (1 Thessalonians 5:18, James 1:2). God brings the good weather and the storm and he is with us in both. That is reason enough to praise him every day! Where did you see your first turkey? How do you give thanks to God? Should I give thanks to God even if I don’t feel like it? What can a Christian do when they don’t feel like God is near? 1. “Wild Turkey Behavior.” (2018). National Wild Turkey Federation online. Accessed November 22, 2018 from https://www.nwtf.org/hunt/wild-turkey-basics/behavior. 2. David Hart. “The Science of Gobbling.” (2018). National Wild Turkey Federation online. Accessed November 22, 2018 from https://www.nwtf.org/hunt/article/the-science-of-gobbling.